Originally the Irrawaddy Dolphin lived all along the coastlines of Southeast Asia, up to the Gulf of Bengal and down to the north Australian coasts opposite to Papua / New Guinea. 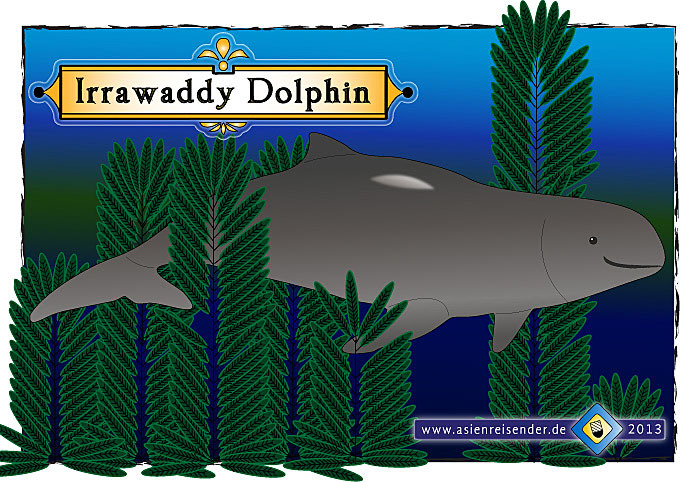 Although he is called after the Irrawaddy River, it's not only a river dolphin. The most sub-populations prefer bays and mouthes of rivers and swim occasionally riverupwards. Others live permanently in rivers, as the population in the Mekong River does. In the Mekong the dolphins come that far riverupwards that they appear in the sout of Laos at Si Phan Don (4000 Islands). 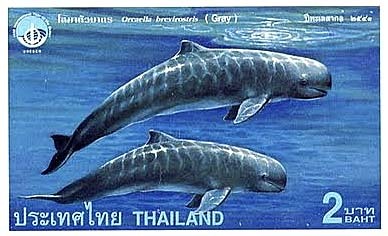 A 2 baht stamp from Thailand (1988) displaying the Irrawaddy Dolphin 'orcaella brevirostris'. Other populations in Southeast Asia appear in the brackish waters of the Songkhla Lakes (less than 50 individuals), on Borneo (Kalimantan) in Indonesia (Mahakam River, the population was discovered and described first in 1986 and numbered to 77 individuals, only 34 individuals are left at present) and in the Irrawaddy River (officially renamed to Ayeyarwady River) in Burma/Myanmar. The Irrawaddy Dolphin is member of the family of whales. Irrawaddy Dolphins usually don't stay long under water, they come up to the surface to catch air every minute or so. But when deep-diving they can stay several minutes under water without taking breath; observations show diving times of up to 12 or 15 minutes. They eat crustaceans, fish eggs and smaller fish and live in small groups of up to six animals, in exceptions more. The dolphins size reaches up to 2,75m, normally not more than 2,30m and they gain a weight of up to 150kg. Remarkable is that the Irrawaddy Dolphin does not have the typical beak other dolphins have. Their colour varies from dark-grey to white-blue. They are able to change their face expression. Their swimming speed is rather slow, it doesn't exceed 25km/h in extreme situations. They like to do spyhopping when swimming around. It's pretty difficult to make a good photo of an Irrawaddy Dolphin. After failing to do so, I sketched one as a substitute. The only halfway reasonable photo I managed to do, after hours of dolphin watching, is the one below. Like other dolphins they have a sophisticated communication system. It does not consist of vocals but of clicks, creaks and buzzes in a high frequency (around 60khtz). There are a number of records when Irrawaddy Dolphins interacted with humans. Indian fishermen reported that the dolphins helped them driving fish in their nets by getting certain signals. In reverse, the dolphins get a share of the catch. Similar stories are to hear from other Irrawaddy Dolphin populations. In our global social-economic system everything has a value, expressed in monetary terms. Everything therefore is used to make profit with. The Irrawaddy Dolphin is no exception. Since the dolphin can be kept in sweetwater tanks, the costs to keep it for the purpose of commercialized shows in dolphinariums are much lower than the maintainance of seawater aquariums. The intelligent animals can be trained to perform silly shows as ball-playing, spitting water, showing spyhopping and so on. Due to the economic development in Southeast Asia more and more Irrawaddy Dolphins end up in such places as theme parks, zoos, casinos, private pools etc. The suspicion is that they are not kept properly according to their needs and well-being. They are reduced to a mere investment and infantile attraction. There is not much evidence to see here that the dolphins gain much respect. The people keep chickens for having food respectively selling their meat for money, and Irrawaddy Dolphins are kept for making a revenue - at the end life is reduced to be a merchandise. Irrawaddy Dolphins reach sexual maturity in the age between seven and nine years. The reproduction rate is not very high. Every two to three years a female dolphin gives birth to a single calf. The dolphins get some 30 years old. Under these circumstances a population loss can easily extend the rate of new-born. There is little known about the population size. The worldwide population is estimated on 7,000 individuals, of whom now 90% are living in the coastal areas of Bangladesh. The populations outside Bangladesh are all classified as 'critically endangered', the Mekong population since 2004. In the whole Mekong River are approximately only 85 individuals left (World Wildlife Fund, August 2011). Since 2003 the population has suffered 88 death, 60% of them were calves under two weeks old. An Irrawaddy Dolphin who died in a fishing net. Although in most of the Southeast Asian countries under protection, this protection means little or nothing in reality. Irrawaddy Dolphins frequently get caught in fishing nets and die. In the mouth of the Mekong in Vietnam the dolphins got almost extinct due to fishing nets. Fishing nets of different kinds are the most dangerous threat for the water mammals. Electrofishing, gold-mining, deforestation and dam building are more threats for the vulnerable animals. The rising pollution level of the Mekong contributes to the vulnerability of the dolphins. DDT, PCB, mercury and other pesticides were found in the dolphins corpses. The pollutants are widely distributed in the environment and weaken the immune system of the animals and pander bacterial infections. That's of course also a threat for the people who live from the Mekong waters and fish. There are also reports about collateral deaths of dolphins due to dynamite fishing (Thailand and Vietnam) and for killing them for their oil (comparable to whale hunting). The 'Bangkok Post' recently and repeatedly reported about 65 dead Irrawaddy Dolphins found at the coast of Thailand's eastern Trat Province in the last three years. Another 15 to 35 dolphin carcasses were found in Ko Chang district. The local fishing industy (using fishing trawlers) is blamed for the death of the animals. The last recent article about that I saw was published on February 23rd, 2013 - seems the killing is still going on there. That made for 2013 already nineteen killed dolphins in Trat Province only. The small, shrinking population which is contained in an isolated area now additionally suffers a limited genetic variation. Resulting inbreed is another cause for many dolphin's death. There is a new protection area in Cambodia between Kratie Province up to the Laotian border to Si Phan Don, 180km along the Mekong River. It was established officially in August 2012.